This outfit is fast becoming a bit of a uniform for me! Here's another incarnation of the Papercut Patterns Rise Turtleneck, worn with a pattern hacked A-line skirt. 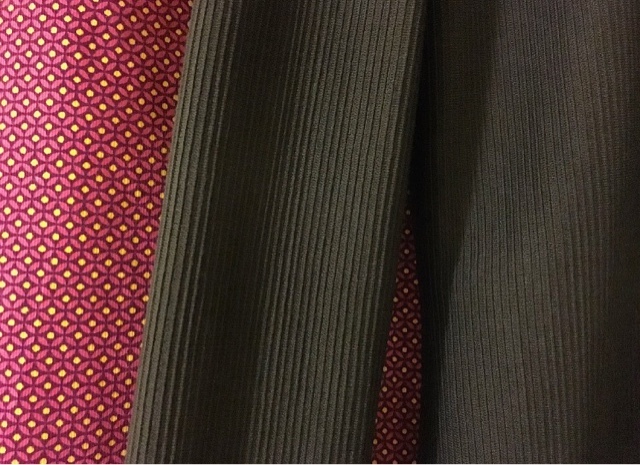 Both are very easy makes, and great for mixing in with the rest of my wardrobe. I'm aiming to go mostly handmade with my clothing choices - I haven't bought any clothes so far this year! - so garments like this are great quick makes when I'm feeling the 'new clothes' need. A close up of the textures - the ribbed fabric shows up black on camera but it's actually navy blue! 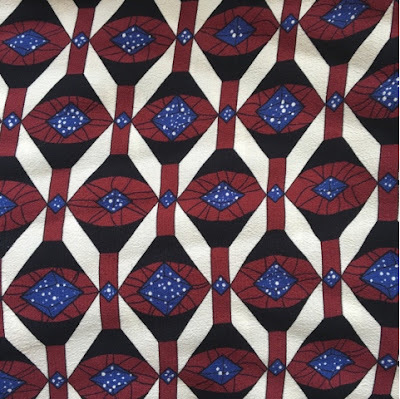 My friend Harriet brought me a metre of this fine cord fabric back from a trip to Copenhagen last year and I've been trying to decide what to do with it ever since! I love the texture and the pattern, and after my last one got a lot of wear, I thought it would be good for another A-line skirt. 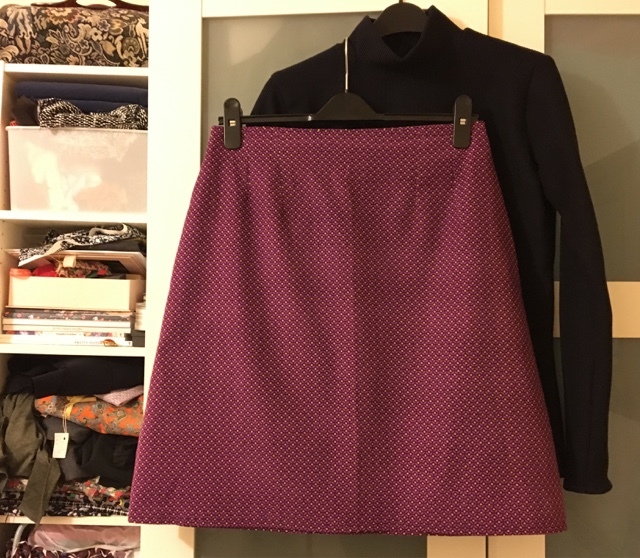 It's the same as the previous one (a pattern hack of a the GBSB pencil skirt) but this time, I took the sides out further to make it even more A-line in shape. I really should have lined it - the fabric just wants to stick to everything - but I was too busy sticking to my own tips on cheap sewing, so it's one to wear with an underskirt. 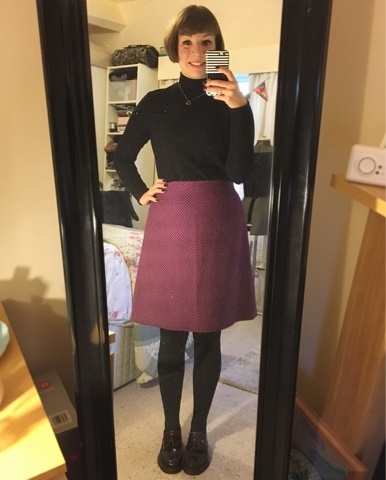 On the plus side, both the skirt and Rise Turtleneck cost less than £10 to make. 1. What/who inspired you to create? The lacking high street pushed me, rather than inspired me, towards making my own clothes. But seeing other people create online and on TV (Sewing Bee!) was a great source of inspiration. My mum is also a brillinat maker, and very much instilled the 'I could make that' attitude in me too. 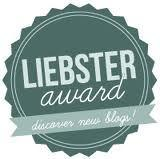 I like reading other blogs! Seeing other people share their fab handmade garments is usually my main reason for picking a pattern. It's also really nice to be a part of a making and sharing community, and helps me keep track of my own progress. Usually how am I going to hack that pattern to make something I've seen on Pinterest/in the shops? Bag construction completely baffles me too, though I'm feeling much better after making the Retro Rucksack. I'm going to be ambitious and try to use the pattern as the basis for a faux leather harness-style bag. 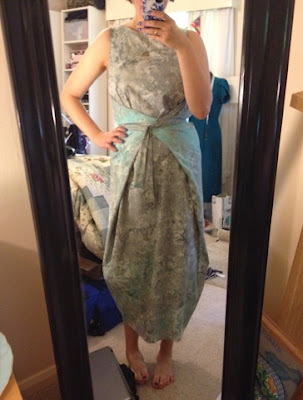 As always, the Kielo Wrap Dress, particularly my first version. I'm also really proud of my my Retro Rucksack and the pattern hacking I did to make this faux wrap skirt too! Funnily enough, it's a Kielo Wrap Dress. I made it in this wonderful batik cotton which was unfortunately totally unsuitable - it has terrible drape and looks like I'm wearing a bed sheet! It's all in the fabric choice! Anything with a nice drape - I like crepe and viscose. My number one fabric of the moment is this BEAUTIFUL Prada viscose I grabbed in Abakhan a couple of weeks ago - can't wait to use it! In terms of pattern designers, I eagerly await the latest Named Clothing collections. And with designers and brands, I like Comme des Garçons, Whistles, Cos and &OtherStories. Quite strange, but getting glandular fever last summer was a bit of a turning point. I had a lot more time to spend thinking about the sort of clothes I wanted to make and wear, and when I could get out of bed, did quite a lot of sewing. I think my style shifted a bit - away from floral/girly, and more towards interesting silhouettes and quality fabric and making - and I got a lot braver with trying things that were a bit different. Getting a new machine was pretty pivotal too - I worked on a half size machine before that couldn't even sew concealed zips. I'd own a house with an ample sewing studio and pattern/fabric stash. Somewhere much bigger than my current corner, where I could keep everything set out and ready to work on at all times! As a thank you for the nomination, I'd like to ask everyone to check out Aimee's wonderful blog, and share the nice feeling by nominating a few blogs of my own. I haven't set any questions, but if my nominees choose to accept, then I'd love to see them share their favourite make, along with 3 facts about themselves or their sewing. Ahh thank you for nominating me and setting such a fun challenge! 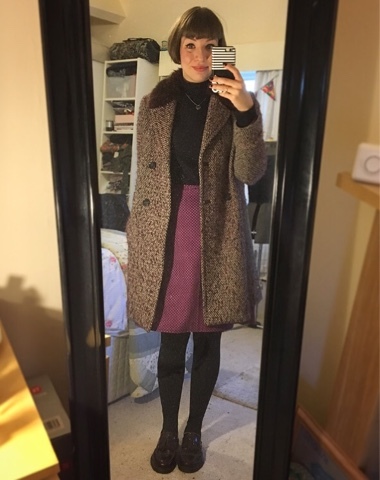 I'm really enjoying wearing the outfit, but the coat is letting the handmade side down - think I'm going to have to explore coat making next Winter which makes me slightly nervous!